I don’t usually blog about cancer risks, mainly because I don’t want to alarm anyone unnecessarily. There are lots of very common genetic variants that add just a little bit to your risk for cancer, but the bigger picture for most cancers seems to be environmental factors. But I’m breaking my “no cancer” blogging rule today to talk about a cancer prevention option may be worthwhile for you, depending on your genetic variants. As always, I encourage you to do your own research on this topic before taking action. Aspirin is a blood thinner, so frequent use includes bleeding risks. This seems to be the main argument against recommending aspirin as a cancer prevention method. It turns out that genetics plays a role in whether aspirin reduces the risk of colon cancer for an individual. 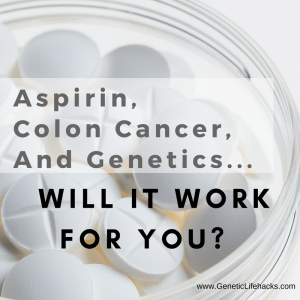 So how does aspirin affect colon cancer? Cyclooxygenase (COX) is an enzyme involved in inflammatory responses. It is also called prostaglandin-endoperoxide synthase (PTGS) and causes the formation of prostaglandins. The problem with COX is that sometimes the inflammatory process doesn’t turn off when it is supposed to. COX inhibitors decrease inflammation and thus the pain associated with it. Aspirin is a COX inhibitor, along with other NSAID pain relievers. Other natural COX inhibitors include Vitamin D, St. John’s Wort, and fish oil. Aspirin, along with most other over-the-counter NSAID’s, is both a COX-1 and COX-2 inhibitors. Some cancer tumors express increased levels of COX, thus aspirin use could help reduce the risk of some cancer types. Other variants (not tested by 23andMe) also can lead to decreased colon cancer risks with aspirin. Again, talk with your doctor and do your research on this before starting an aspirin regimen.